Hey guys. 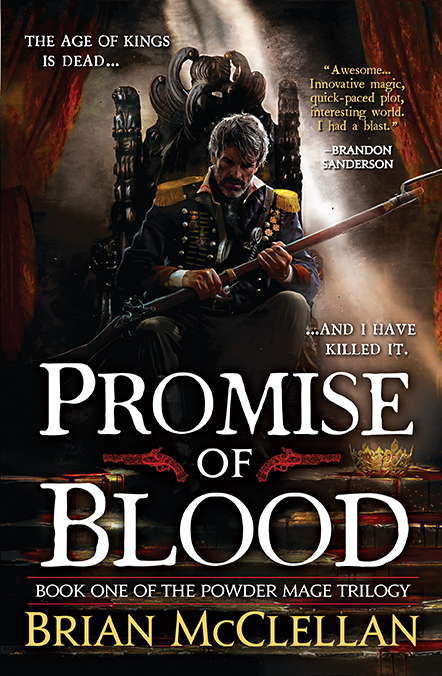 A lot of you have been emailing, messaging, tweeting, or what have you asking for ways to get your hands on signed copies of Promise of Blood. This coincides happily with me trying to clean out space for the arrival of my Crimson Campaign copies. I've made a number of different formats of book one available for purchase* (signed and dated). This includes just two copies of Promesse du Sang, the French language version. Click here to find out how to get them. If you're looking for signed copies of The Crimson Campaign, you can order them from Goldsboro (UK) and VJ Books (US). *These are only available in the US. International shipping is crazy expensive, as much as $30 per book. If you still want to get a copy from me and are willing to foot the bill for shipping drop me an email at brian (at) brianmcclellan (dot) com. Hey guys! Just two weeks left until the Promise of Blood trade paperback hits shelves in the US. As some of you may have seen on twitter and Facebook yesterday, the UK paperback has entered it's second printing (it's been out since January). That doesn't necessarily mean that the same will happen in the US but it certainly bodes well, so if you want to be certain you'll get your mitts on a first edition of the trade paperback you should pick it up ASAP. Pre-orders are always the best! And speaking of pre-orders, only six weeks until The Crimson Campaign comes out in the North America and the UK! Woohoo!